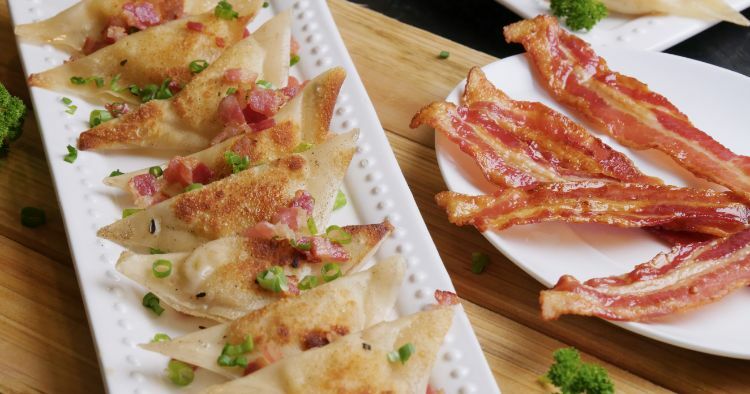 Potato and cheddar is a classic flavor of pierogi, and the recipe below makes them easy to prepare at home. 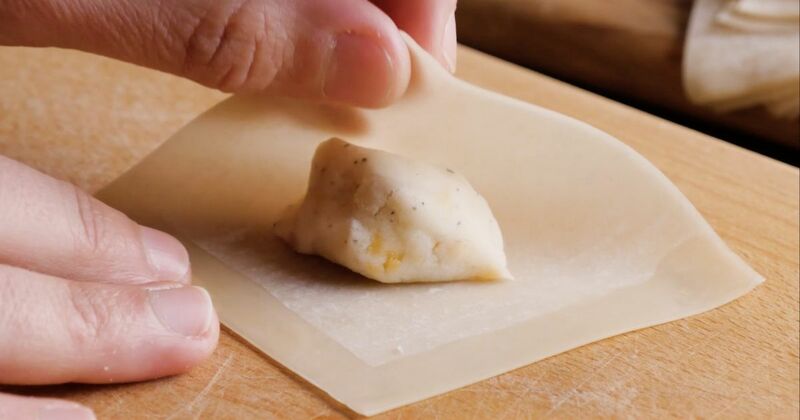 Instead of making a homemade dough, you'll fill store-bought wonton wrappers with a rich potato and cheddar cheese filling. When you're ready to eat them, just sauté them in bacon and onions, and serve. These pierogi are also easy to make in large batches in advance. Freeze them in a single layer on a baking sheet before putting them in freezer bags to store. You can cook them straight from frozen: Just bring a pot of water to a boil, drop them in for 2–3 minutes, and then proceed with the rest of the recipe as written. Preheat the oven to 400 degrees. Prick the potatoes on all sides with a fork, wrap in aluminum foil, and bake for 45 minutes, or until tender. Scoop the flesh out of the potatoes into a bowl. Add the sour cream and butter, and mash until smooth. Mash in the cheddar and garlic powder, then season with salt and pepper to taste. Set aside to cool completely. When ready to make the pierogi, whisk the egg and water together. Mound about 2 teaspoons of filling on a wonton wrapper, then brush the egg wash over the edges and fold into half-moons. Reserve on a tray until ready to cook. When ready to cook, heat the butter in a pan and add the bacon. Cook until the bacon is crisp, then remove, leaving about a tablespoon of the remaining fat in the pan. Add the white and light green portions of the onions to the pan and sauté for 2-3 minutes. Push to the edges of the pan and add the pierogi, cooking for 2-3 minutes per side (work in batches if needed). When all of the pierogi are cooked, add the bacon back to the pan, as well as a touch of reserved fat if desired. Serve sprinkled with green onions with sour cream on the side.